Given all the pandering on the issue of illegal immigration you'd think hordes of undocumented immigrants are flooding across our southern border. Is that true? In a word, "No." 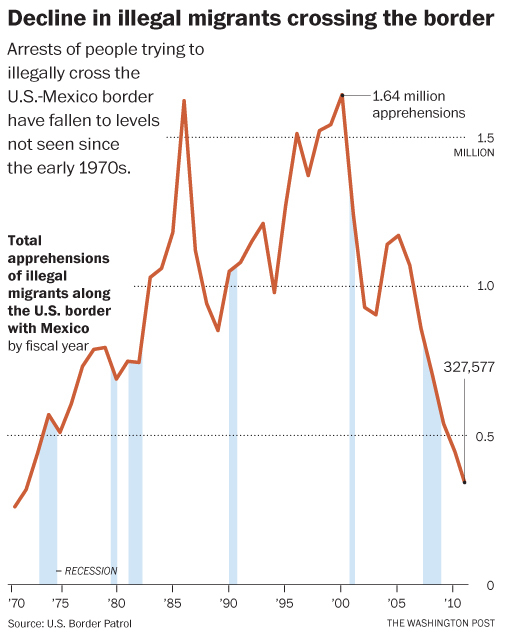 According to the U.S. Border Patrol arrests of people trying to illegally cross the U.S.-Mexico border have plummeted to a 39-year low. Improved surveillance, increased numbers of border patrol personnel, and a poor U.S. economy have combined to make illegal immigration a non-issue. At least it should be a non-issue. Congressional Republicans are holding up immigration reform saying we must first secure our borders. The fact is our borders are secure. The influx of illegal immigrants is almost exactly balanced by undocumented immigrants voluntarily returning to Mexico. There is very little net gain, if any, yet Republicans continue to pander the issue. The illegal immigrant bogeyman resonates with their paranoid low-information constituents and they aren't about to give it up, contrary facts notwithstanding. I happen to be reading Vollmann's Imperial, his giant treatise essentially on the immigration issue that he wrote after visiting Imperial County California for 10 years. Should be required reading for presidential candidates (well, the ones that can read anyway). And I think the main point is, if you want to reduce the problem further or completely, then improve Mexico. Sounds like meddling, but overall, any dollars we spend to improve the other side of the line comes back in multiples. And one way to do it is make a system that allows workers to be on this side of the line and to return to that side of the line to the benefit of all. The farmers in the valleys of CA have known they need the workers for a long time. They try to work around the system. And, lastly, though Vollmann may not agree, immediately repeal the rule that children of illegals born on this side of the line are American citizens. It was never designed for this and it just compounds the difficulties for everyone involved. Before this date you are a citizen, if you have proof you were born here. And after this date, it no longer applies. Do it now. Screams will issue from several directions. But do it anyway. "All persons born or naturalized in the United States, and subject to the jurisdiction thereof, are citizens of the United States and of the State wherein they reside." So says the citizenship clause of the 14th Amendment. The U.S. Constitution is pretty clear on the issue of jus soli. The applicable statutory law says, in part, that the following acquire citizenship at birth: "a person born in the United States, and subject to the jurisdiction thereof." Neither the 14th amendment nor statutory law require any adjudication of the status of the parents or their intent. Did they come across the border just so their child would be a U.S. citizen and then try to use that as leverage to themselves become legal residents? Doesn't matter. Of course the statutory law is subject to change by Congress and I'm sure plenty of Republicans would very much like to repeal it, but the issue is moot, because of the citizenship clause. The fact that the 14th amendment was originally intended to clarify the status of freed American born slaves does not change the text of the law. Even Justice Thomas would have trouble getting around that. With the current polarization of national and state politics, the probably of a constitutional amendment to modify the citizenship clause is nil. Panderbear's view is that a nation which boasts the Statue of Liberty as one of its icons would not be true to its fundamental principles if it denied citizenship to any person born within its borders. Basically this was an amendment to overrule the Dred Scott decision, which any of us with a soul would have had trouble with. A decision that was an attempt to deny slaves and the black population any chance or hint of citizenship and the 14th was an attempt to quiet the call from the south to make their progeny forever non-citizens. Applying this to pregnant illegals who give birth in Imperial county CA or Yuma county AZ is a stretch of the original intent. It is a matter of opinion obviously. When do we stop harboring the wretched and the poor as Lady Liberty requests? If I was to stare into the face of the Latino ladies hoping off the trains in the dark of the desert, I am sure I would swing the other way, but broadly, and from the comfort of my home I request we reverse the auto-citizenship rule for aliens with a specific set cut-off date and amnesty for all who came before. "Applying this to pregnant illegals who give birth in Imperial county CA or Yuma county AZ is a stretch of the original intent." Some conservative justices on the U.S. Supreme Court, for example Justice Thomas, are textualists. They have no truck with original intent. They only consider the actual words of the constitution, without regard to original intent or any possible interpretations that take into account over two hundred years of American history. I disagree with them, but original intent, stretched or otherwise, would not enter into their decisions. Panderbear does not see the pressing need to deny citizenship to those who by no choice of their own were born within our borders. But as HR notes, that is a matter of opinion.